I never thought I would start a blog entry by quoting the Jackon Five, but “one bad apple don’t spoil the whole bunch, girl.” Aysha, our guide for our tour of the ruins at Ephesus, or Efes to the Turks, was wonderful. So was our tour group. This time the whole group was English speaking, but just as diverse coming from Australia, England, Malaysia, and the US (us). We were a smaller group, too – only ten. 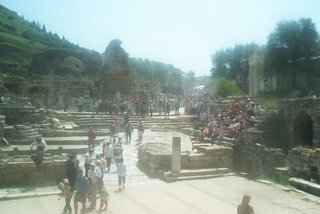 Our trip today included Ephesus, the Temple of Artemis, and the site of the house where Mary, Jesus’ mother, lived out the last years of her life. Diversity comes in many packages. Our tour group in Greece was all from North America, yet covered a wide theological spectrum. Our first group in Istanbul was twenty-two people from ten or eleven countries; we hardly shared language in common, which made it difficult to find out if we shared much else. Our group yesterday was all English speaking and incredibly diverse in age, outlook, and world view. Somehow we seemed to get along with each other best of all. The fun part is eight of us are on the same tour today, as is Aisha. We all seemed quite pleased to find that out. 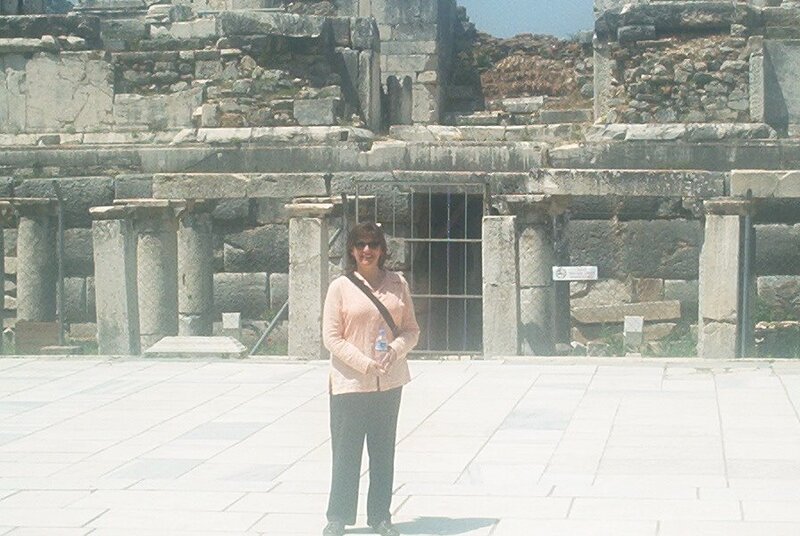 I didn’t expect what we found when we got to Ephesus. Of all the sight s we have visited, this was by far the largest and the one that fed our imaginations the most. 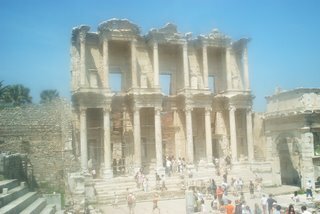 We wandered through the ruins for over two hours as Aisha told us about the different incarnations of the city dating back for several centuries BCE. Most of the ruins that have been excavated are Greek and Roman. Several of the main streets have been restored. 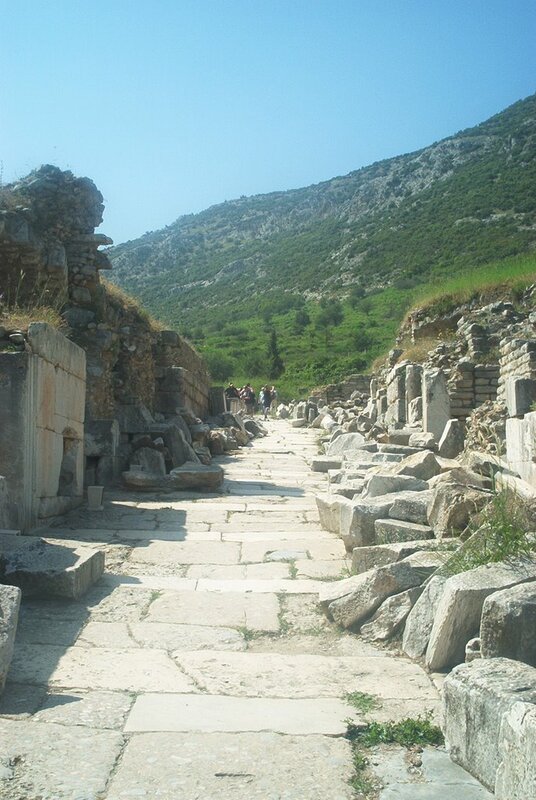 The site was crawling with visitors, so walking down the marble roads left me feeling as though I had a taste of what it might have been like when Paul walked the same streets, bumping shoulders with others traveling the same path. I wonder wha t it felt to know the dimensions of the Temple of Artemis, with its multiple rows of columns, each one ninety feet tall, and then to read Paul’s prayer that they might have some sense of the unfathomable dimensions of Jesus’ love for them. However tall the buildings, however deep the wounds of persecution, however wide the Roman Empire, however long the wait for the pain of life to ease, Christ’s love exceeded those measurements. I can only imagine they read the letter over and over again. As the first century turned into the second, and Christianity took a strong hold on the city despite everyone else’s efforts, John, the apostle, and Mary, Jesus’ mother, lived in Ephesus. Some of the materials we have suggest John might have written his gospel from here. He returned to the city after his exile from Patmos and died here. We are going to see his tomb in the next couple of days. We did go to the site where Mary’s house was to have been. 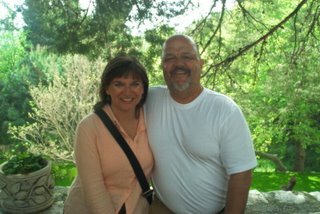 It was a wonderfully peaceful place on the top of a hill overlooking the old city. There is now a small chapel built on the ruins of the foundation of what is believed to have been her home. We learned that Pope Paul visited the site in 1967 and declared it holy so that Catholic pilgrims come here every August 15. No one seemed to know why the Pope picked August 15. On the May 3, the area was sparsely populated, which gave us time to walk, reflect, and enjoy the beautiful serenity we found there. The “us” I’m talking about was Ginger, me, and two guys from England, Adam and Joel. The others chose to go to the museum. The two guys left England several weeks ago with a plan to travel, some money in their pockets, and a promise to their girlfriends to be back by the end of the year. They have tromped through Europe, are headed from here around the Black Sea to Russia, and then across Mongolia to China. They have a skeleton itinerary as they are making things up as they go. They already have more stories than they will ever be able to tell. Another pair, Cam and Rachel, are from Australia and are doing much the same thing. Part of the way they are financing their trip is to get jobs when they start to run out of money. They don’t have anyone expecting them back anytime soon, so they have no idea how long they are going to be gone. They told us today they had gotten jobs at the hostel here in Selcuk and are going to hang around a couple of months. 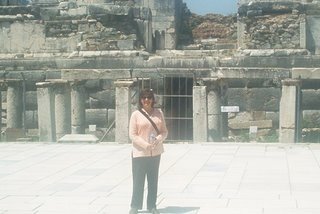 I imagine Paul traveled with much the same kind of itinerary; he never planned to live in Ephesus for three years. He got here and there was stuff to do and he could make a living while he was here. Then he was off to the next place, so he could discover where he would go after that. The ruins and the stories of our temporary traveling companions made Paul more real. I can see where he walked. I can see what he wrote. I can see how he traveled. All together, it makes for quite a view. Fear not. “One bad apple…” is a song by The Osmonds, not Jackson 5. Milton and Ginger, I love reading about your adeventures! Bring me back a Turkish rug!! !